Elsa and Me’s perfect little black dress just got even more perfect. The one-size-flatters-all sheath, made in New York City’s Garment District from organic cotton, now comes in vanilla white and midnight blue. 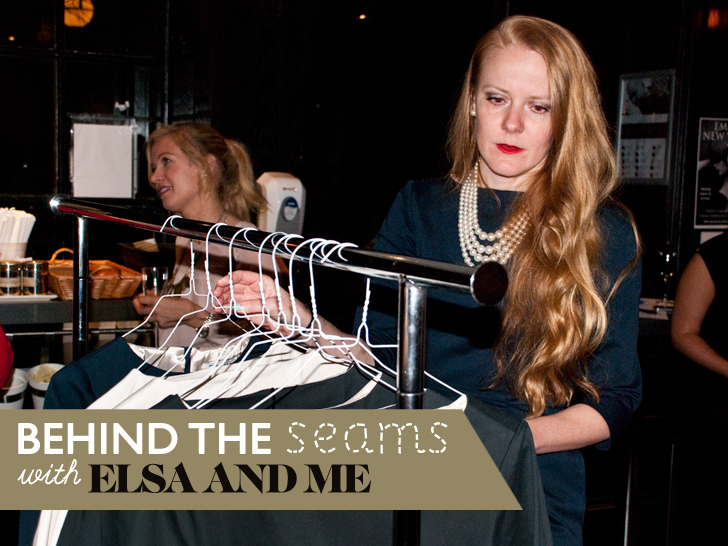 We caught up with Maja Svensson, the label’s Sweden-born founder, at a recent release party, as well as in her Brooklyn studio, to get the inside scoop on the genesis of the brand, her design philosophy, and the plans she has in store for Elsa and Me. Where did your interest in fashion originate? I’ve always had my own style and I think I’ve always had a very specific style since I was younger. I haven’t cared too much what other people think about what I wear. When I thought about starting my own business, I was more concerned with having a company than thinking about what the product was going to be. I’ve realized I am an entrepreneur. I realized that you don’t have to be a fashion designer to design clothing. When I came to New York, I was very inspired. There are a lot of people here doing their own thing and it’s very different from the Swedish environment in terms of entrepreneurship. I got in contact with a lot of fashion designers, and I realized that you don’t have to be a fashion designer to design clothing. As long as you have a visual idea of a design, you can realize it with a competent pattern-maker. As soon as I understood that, I contacted a pattern maker who was recommended by a friend and decided that I wanted to test it out. I started by making one blouse, one dress, and a pair of pants. I started by making one blouse, one dress, and a pair of pants. 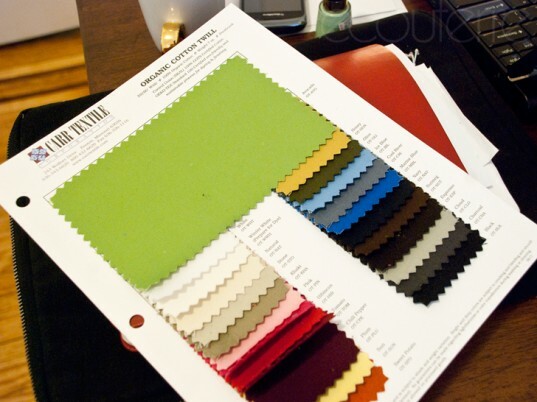 I went into Mood Fabrics, explained my idea, and asked for advice. How do business models in the United States compare with Sweden’s? I would say the idea of risk is different here because Sweden’s thick social security system is nice but also makes people very risk-averse. The environment is not as supportive of people starting a company. Rather, it is more questioning. Does your prior experience with Invest Sweden give you an advantage in terms of understanding the market? I think it gives me advantage as a businesswoman and my network of people. I got in contact with a lot of savvy investors, which was a very good thing. I had one investor who was excited about the prospect of me moving production to China once I got big and I had to say, “Wait now, it’s important for me to produce locally.” As of now, with my price point, it works and as my volume increases, my production prices here would also go down. That comment just didn’t make sense to me. Both my Grandma and Mom are from a generation where they sewed all their own clothes. Elegant with a twist. My inspiration for Elsa and Me is my grandmother, Elsa. I think that I have her style because she is very elegant and classy yet colorful. Both my Grandma and my Mom are from a generation when they sewed their own clothing. My grandma did a lot of clothing for my Mom and my Mom made a lot of her own clothing. How does that intimate relationship play a role in your design process? I think overall there is a story in clothing, and you can mitigate the effect of trends if you value the story behind your clothes. Proudly wearing clothing that has been passed down is one great way to do this. You can mitigate the effect of trends if you value the story behind your clothes. When you think about sustainable and ethical fashion, how do you approach them? I think about clothing as something you’re supposed to be able to wear today that withstands trends. I think classic clothing is sustainable because you can wear it today or 100 years from now. Of course, I would also want the material to be organic, which can often be very limiting. The new midnight-blue dress is made from 100 percent certified organic cotton from India. 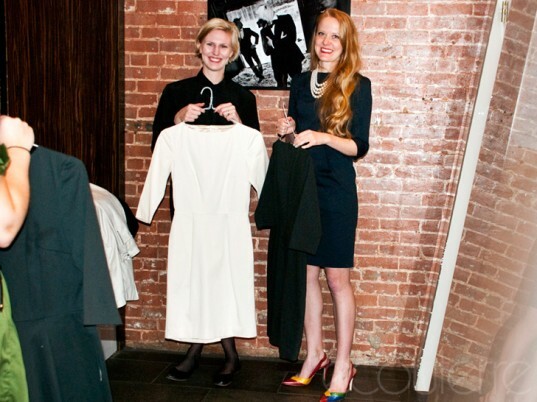 The black dress is 98 percent organic cotton and 2 percent Lycra. I have yet to find lining that is organic, nor a sustainable zipper. I don’t have any inventory besides a sample for each size which also lessens waste. Are your dresses available in stores or only through trunk shows and private fitting sessions? It’s all through fittings and smaller gatherings. I think that’s how I’m able to do it this small at the moment because that way I get the whole margin. When people try dresses on and make an order, they pay first and then I produce, so I have capital for each production. I don’t have any inventory besides a sample for each size which also lessens waste. In a month, I usually sell between 30 and 40 dresses, with each selling for around $200. My clients range from 25 years and up and most of them find out about me by word of mouth. What’s next for Elsa and Me? I have a line up of releases for now through the summer that will be unveiled gradually. I’ve been looking at Tencel but there is no organic certification for it yet. I could see myself going towards Tencel, however, because it seems like a good crop in terms of how it’s grown. The current plan is for 2012 to be the year of the “Elsa” dress with different fabrics and colors. The current plan is for 2012 to be the year of the “Elsa” dress with different fabrics and colors. All of the existing colors will be available through the year with limited editions of select designs to come. For 2013, I’m hoping to come out with a couple more casual but business-appropriate dresses and also step things up with some cocktail dresses. I’ve some organic silk fabric in mind that would be great to work with for that.